The UK looks set to have its first ever televised prime ministerial debates after a deal was struck between the big three parties and broadcasters. 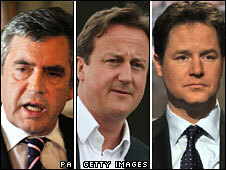 Labour's Gordon Brown, Conservative leader David Cameron and Lib Dem leader Nick Clegg have agreed to go head-to-head in a series of three debates. The first will be on ITV, the second on Sky and the third on the BBC. There will also be separate debates involving the main parties in Scotland, Wales and Northern Ireland. Earlier the SNP and Plaid Cymru said they should be allowed to take part in the main debates. Live presidential debates in the US and other countries have provided many of the key moments of election campaigns and are seen as having raised voters' interest. But in the UK, despite many calls for such debates to be held, there has never been agreement reached between leaders and with broadcasters. Will you watch leaders' debate? The programmes will be broadcast in peak time during the General Election campaign and will be between 85 and 90 minutes long in front of a selected audience. ITV's Alastair Stewart will host the first, Sky's Adam Boulton the second and the BBC's David Dimbleby will host the third debate. The format will be the same for each, although about half of each debate will be themed. There will be separate debates held in Scotland, Wales and Northern Ireland among all the main parties, which will be broadcast on BBC Scotland, Wales and Northern Ireland and across the UK on the BBC News Channel. And following the prime ministerial debates, all political parties which have significant levels of support at a national level will be offered opportunities across BBC output to respond to the issues raised in the debate. Prime Minister Gordon Brown told the Daily Mirror: "I relish the opportunity provided by these debates to discuss the big choices the country faces. "Choices like whether we lock in the recovery or whether we choke it off; whether we protect the NHS, schools and police or whether we put them at risk to pay for tax cuts for the wealthy few." 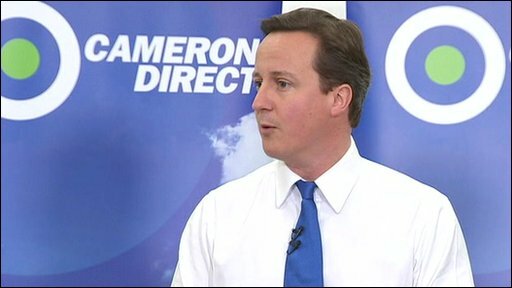 Speaking at a public meeting, Conservative leader David Cameron said: "I have always believed in live television debates. "I think they can help enliven our democracy, I think they will help answer people's questions, I think they will crystallise the debate about the change this country needs." Liberal Democrat leader Mr Clegg said he was "delighted". "After a terrible year for politicians because of the expenses scandals, these debates will be an opportunity to start re-engaging people with politics... I hope an open, honest and vigorous debate will encourage more people to have their say at the ballot box." The election is widely expected to be held on Thursday 6 May although there has been speculation that it could be called for 25 March instead. Ric Bailey, the BBC's chief adviser on politics, said a lot of work had been done to get agreement and there was still some way to go on the detail. He added: "I think it is quite significant in the sense that it's never happened before and all three of the biggest parties in the UK have agreed to do it." Discussions will resume in the new year to finalise detailed arrangements for the debates. Opposition leaders regularly call for TV debates in the run-up to general elections but while they are commonplace in the US, they have not been held in Britain. Tony Blair refused to take part in one when he was prime minister and Mr Brown has previously argued that the situation is different in the US, where presidents are directly elected. British prime ministers have argued that they are questioned regularly, at prime minister's questions and in statements to the Commons. Critics also say such debates overly personalise a UK election campaign, where people vote for a local MP rather than directly for a leader. There have also been questions about whether the debates should be a head-to-head between the leaders of the two largest parties or whether the Lib Dem leader should also be included. Earlier, before the announcement was made that debates would be made available to other parties, the SNP and Plaid Cymru said they should be allowed to take part in the main debates. Scottish National Party leader Alex Salmond said he would be seeking "guarantees of inclusion from the broadcasters, given their inescapable duty to ensure fairness and impartiality in election-related coverage in Scotland. "It is entirely unacceptable to Scotland as well as to the SNP for the broadcasters to exclude the party that forms the government of Scotland - and indeed is now leading in Westminster election polls," he said. And Plaid Cymru's Westminster leader Elfyn Llwyd said it was "completely undemocratic" as it would give the main parties an unfair advantage. He said he would complain to the Electoral Commission. "Both Plaid Cymru and the SNP are in government in the respective devolved administrations and it is an insult that such important political voices are to be left out of such a historic event," he said.